Arcade offer an extensive collection of Belle Époque inspired beautifully crafted ceramic sanitaryware, decadent free-standing baths, superb showering masterpieces and outstanding fittings and accessories in a nickel finish. Every piece is lovingly crafted and hand finished with exceptional care using the finest materials and manufacturing process. This timeless style will fit into any traditional or contemporary bathroom that will certainly add a classic and luxurious look and feel. All Arcade products carry a 10 year guarantee. 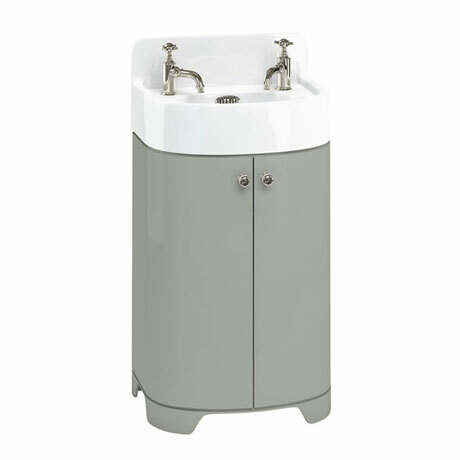 This stylish floor standing vanity unit and basin comes from an inspired range of luxury furniture from Arcade. It features soft closing doors and beautifully crafted nickel plated handles. Available as a single right hand tap hole or two tap hole option, combine it with one of Arcade's elegant taps to create a timeless look.